Can Guinea Pigs Climb out of a Cage? Guinea pigs, being social creatures, do best kept in groups of two or more, but most readily available commercial cages are not large enough to house a pair of pigs. The "old" guideline of 2 square feet per guinea pig is considered out-of-date and cramped by many owners. Cavycages.com recommends 7.5 square feet for a single guinea pig and 10.5 feet for a pair. Even at that, if you can provide a bigger cage, your guinea pigs will benefit from the extra space. In many cases, a homemade cage provides ample space inexpensively and you can make quite creative cages easily. These are usually a better choice than a cramped commercial guinea pig cage (more on homemade cage ideas below). Cages with wire floors or wire ramps must be avoided, but, otherwise, guinea pigs are not too demanding in what sort of cage they need. Cages with ramps and low plastic shelves or ledges provide some added interest for the guinea pig, but be careful they do not take away needed floor space for running laps. The spacing between the bars can be up to one inch for adults. Some owners have come up with very creative solutions to the problem of providing large enough housing. The good thing about guinea pigs is that they are fairly large and not all that big on climbing or chewing, and are not likely to climb or jump over a wall that is reasonable height (18 inches should contain most pigs). A little creativity can go a long way to providing ​great guinea pig enclosures, especially for groups of guinea pigs if you have enough room. The "Cubes and Coroplast" style of ​cage has become very popular. Stay away from most of the cages marketed for guinea pigs as they are terribly small. There are really only a few commercial cages that approach a good cage size for guinea pigs. For bedding, avoid cedar shavings and ideally pine as well. Aspen shavings are an acceptable choice, as is hay (a layer of paper underneath will help with absorbency). The newer recycled paper beddings are a good choice too, as are numerous other new types of pet-safe bedding and litter being made now. A nest box or hiding place is a necessity - an overturned plastic tub or pail, or a cardboard box are fine (the cardboard box can just be discarded if soiled and replaced). Large diameter PVC pipes (with thick walls) make good tunnels and hides too. Toys should be added for interest. Paper bags make good toys/hides, and crumpled paper, cardboard boxes, balls, wood blocks, hard plastic cat and rabbit toys, fleece tunnels, small fleece blankets, willow rabbit toys, and hanging bird toys might also interest your guinea pigs. Just make sure there are no small parts that might come off or get chewed off and swallowed. Wheels and exercise balls are not recommended; many experts believe that guinea pig bodies are not designed for this kind of exercise and the risk of injury is too great. Try to provide exercise using other means. For a food bowl, a heavy ceramic bowl is a good choice. To keep a good supply of clean water, use a water bottle with a steel spout and ball, rather than a water bowl. Keep in mind that guinea pigs tend to drink a lot (and some "play" with the bottles) so keep an eye on their water supply throughout the day and replenish as necessary. A small hay hopper can be added to keep a supply of clean hay for the guinea pigs to nibble. The cage will likely need to be cleaned weekly or more often. Unless your enclosure includes​ lots of space for exercise, your guinea pigs should be given room to exercise. 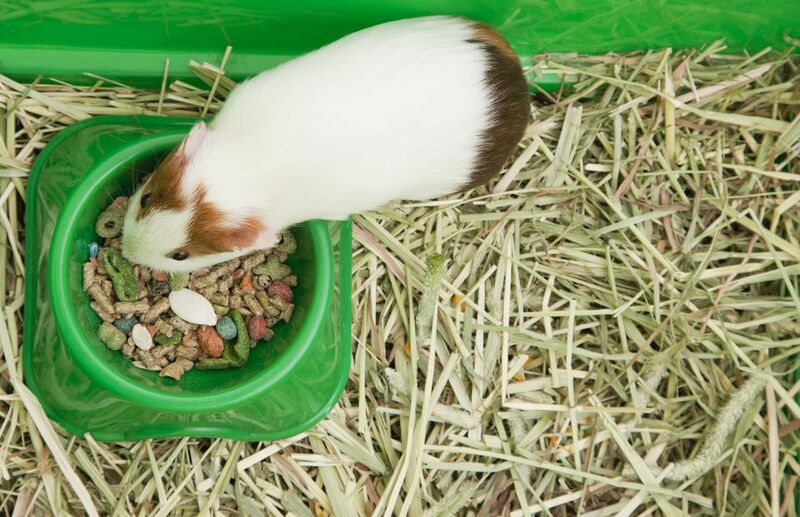 A portable wire pen (you can make your own or buy wire playpens made specifically for small animals or dogs) can be used as a corral for the guinea pigs and keep them out of trouble (getting under furniture, chewing on wires etc.). Your guinea pigs might enjoy a trip outside in warmer weather - a wire pen (totally enclosed, for the guinea pigs' protection) placed on the lawn will be a nice change of scenery. Only do this if you do not use any pesticides or fertilizer your lawn. Make sure water and shade are available at all times when they are outside.